2018 hasn’t been the year for the little guy. 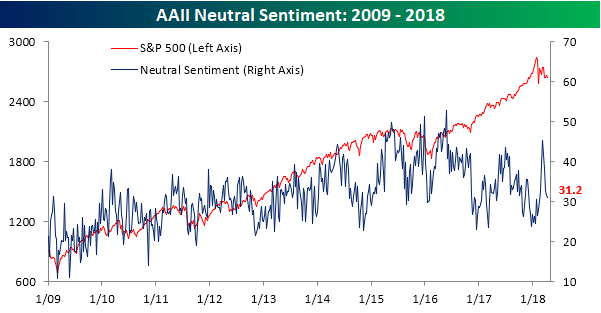 Late last year, individual investors appeared to be finally getting comfortable with stocks as bullish sentiment in the weekly poll from AAII topped 50% for the first time in nearly three years. For a little while, they enjoyed the ride as equities surged to start the year and bullish sentiment reached just shy of 60%. Then the correction came. Since then, the bulls have been in steady retreat as increased volatility and lower prices remind these individuals why they were so apprehensive in the first place. 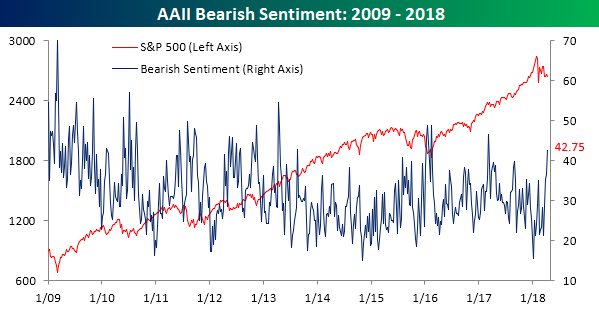 This week provided a further confirmation of that trend as bullish sentiment in the weekly AAII poll dropped from 31.9% down to 26.09%. 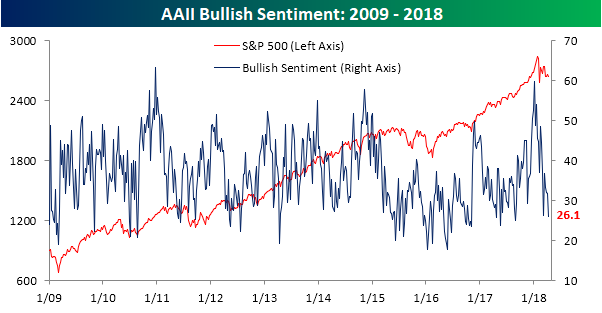 This marked the fourth straight week of declining bullish sentiment and took the percentage of bulls to the lowest level since last August. The investors leaving the bullish camp recently aren’t just moving to the neutral sidelines either. They are flat out bearish. In this week’s survey, bearish sentiment surged from 36.6% up to 42.75%. Bearish sentiment has now increased by more than 20 percentage points in the last four weeks and is at its highest level since last March. Fence sitters have plummetted in recent weeks as well, so it’s not as though investors don’t have conviction. After hitting a recent high of over 45% in early March, neutral sentiment is now down to 31.2%.